and, most importantly, is a conduit for the electrochemical synapses of your brain. While some of these are nice for adults, focusing, problem-solving, short-term memory, learning, and brain functioning are essential for our children’s success. Reducing fatigue, controlling appetite (not feeling hungry when the body is not actually in need of food), and reducing pain are helpful in maintaining “even-keel” and not contributing to stress and meltdowns. We have all had a moment when we caught ourselves over-reacting, grumpy, or not thinking clearly as a result of hunger or low blood sugar. Why do we expect our children who have not had decades of social learning and practice self-regulating to function without balanced blood sugar? The material provided to us during TBRI training reminds us that “for children from ‘hard places’…insulin receptor sites have been dramatically altered. For these children, even minor fluctuations in blood glucose can affect learning and lead to behavioral episodes.” (Purvis, K. Cross, Dr. R., Hurst, J. R., & Milton, H. . p. 26, Trust-Based Relational Intervention: TBRI Empowering Principles [Instructor Workbook]. Fort Worth, TX: TCU Institute of Child Development). When you add in food insecurity for children who may not have received enough food in the past, making sure food is consistently available becomes hugely important. As a mom, I am nearly never without some sort of snack on me; there are baggies of almonds and cranberries in my backpack, Larabars in my purse, and mango juice in the car when I pick my son up from school. It is not about avoiding whining or having to purchase food on the go as much as it is being able to immediately say “yes” to my son, making sure he is given the highest quality foods I can provide, and helping him function at his best. Before we start trying to teach our children new behavior or expecting them to be able to self-regulate when things are not going their way, we need to make sure we are helping them proactively manage physiological stasis. Let children know what snacks they can have any time (even when you are preparing dinner). The fruit drawer, the snack basket in the pantry, and any left overs the kids have put in the refrigerator are always fair game. 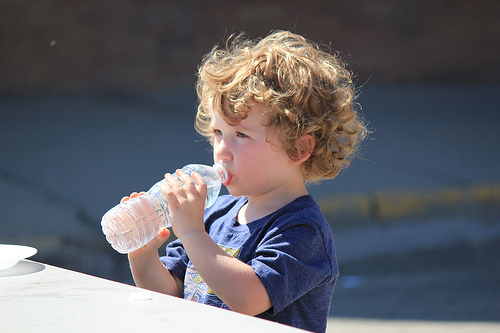 What other ideas do you have to help parents keep hydration and blood glucose stabilized?